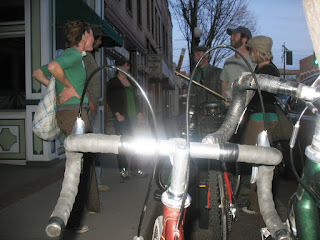 What the 1st annual St Patty's Day Pedal lacked in quantity, it most definitely made up for in quality. We were few, but we were mighty! New friends were introduced, old friendships strengthened, laughs were had all around, and everything was brought together via the bicycle. The ride started small, with just Jess, Alex, and I at the first stop, but more than doubled at the second stop with the arrival of Parks, Kristin, Holly, and Megan. If you weren't able to make it out for this ride, more will be planned soon! So get off the couch and turn off your television and come on out for some fun!